With a stay at Carmel by the Sea in Broadbeach, you'll be on the beach, a 3-minute walk from Kurrawa Beach and 12 minutes by foot from Pacific Fair Shopping Centre. 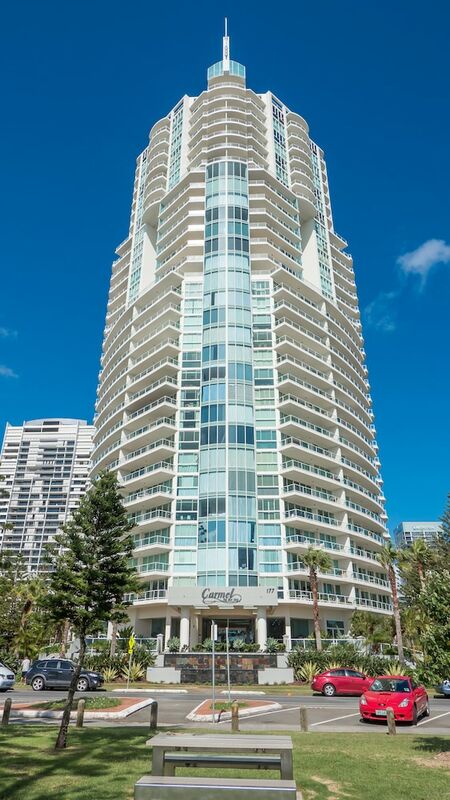 This 4.5-star apartment is 0.6 mi (1 km) from Gold Coast Convention and Exhibition Centre and 0.6 mi (1 km) from The Star Gold Coast. In addition to an indoor pool and an outdoor pool, Carmel by the Sea provides an outdoor tennis court and a spa tub. Public areas are equipped with complimentary wireless Internet access. This Mediterranean apartment also offers a children's pool, a fitness center, and a sauna. Onsite self parking is complimentary. Carmel by the Sea has designated areas for smoking. An indoor pool, an outdoor pool, a children's pool, and a spa tub are on site. Other recreational amenities include an outdoor tennis court, a sauna, and a fitness center. Cribs (infant beds) are available for AUD 35.0 per week. This property's policy is to refuse certain bookings for the purpose of group events or parties, including pre-wedding stag/bachelor and hen/bachelorette parties. Pool access available from 7 AM to 9 PM.Only registered guests are allowed in the guestrooms.